The boys have always been interested in Science since they were little. They are fascinated by the different animals and insects that they have seen and love to read up on different science facts in the books that we borrow from the library. 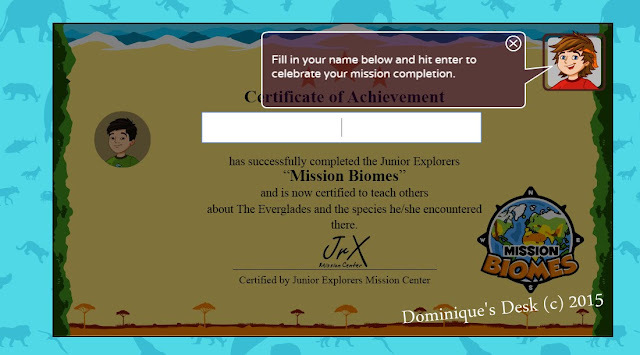 This month they were privileged to be able to trial run Junior Explorer’s Subscription program- a Science based activity program which has both online and offline components to complete based on the given theme of the month. There are several options for subscriptions. It is recommended for you to take a 12 month subscription as it will certainly be most effective with regular exposure to the program. 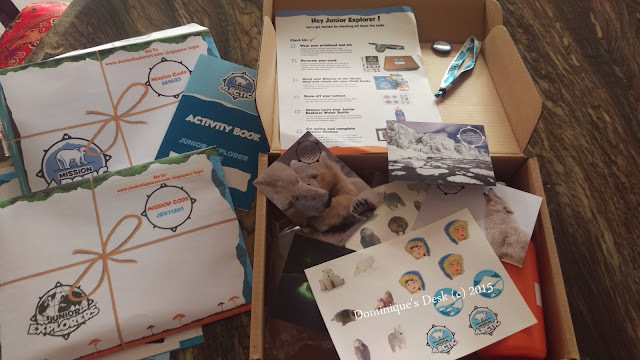 Once you have secured your subscription you will get Explorer Kits sent to your house and enjoy exploring various topics in Science from the comfort of your home. Targeted at ages 6-11 years old this package composes of the following items. 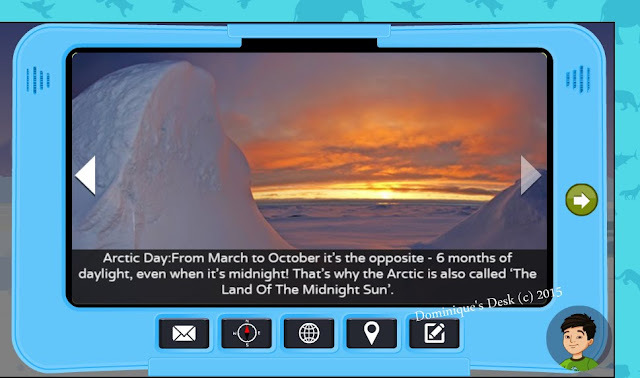 The Welcome package and Arctic Mission Kit which we received consists of the following item. Stickers to decorate the cardboard Kit box with. The boys couldn’t wait to get started so we settled down to have a look through and read up on the facts before we started the online part of the mission. 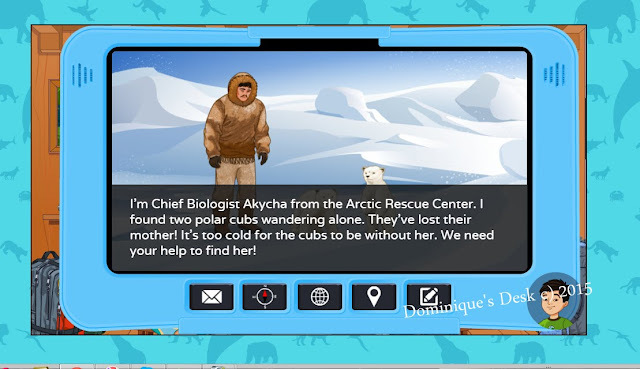 There was quite a bit of information which the boys had to digest before they started on their Arctic Mission. We read through the mission card together and looked the fact sheet we were given. 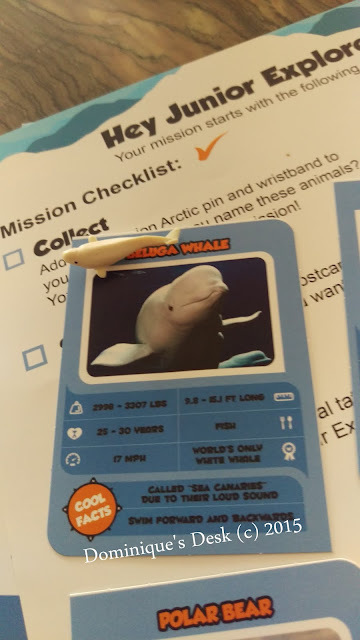 There were 6 trading cards that came with the Arctic Mission package. When the boys had completed reading through the fact sheets it was time to start the online part of the mission. We logged into the system and embarked on the ARCTIC Mission together. 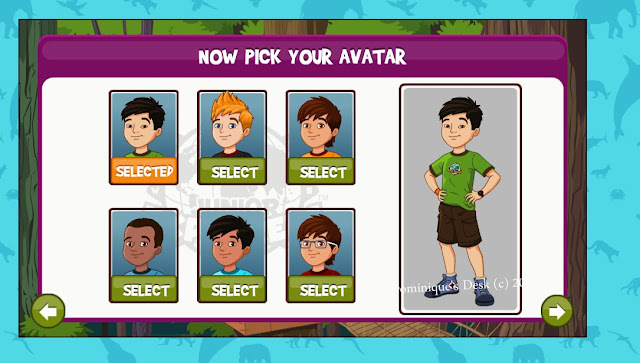 First up they had to choose the avatar which they wanted to represented them. Doggie boy chose the avatar you are seeing on the right of the picture above. An introduction by Chief Biologist and they were off on their mission. After going through the the factual slideshow the boys were all ready to try out the interactive part of the mission. I didn’t get around to taking any screenshots of the games they tried as they were too engrossed in them to pause for me to capture a screenshot. Before I knew it they had completed the mission and were completed and they were able to key in their name for a Certificate of Achievement. 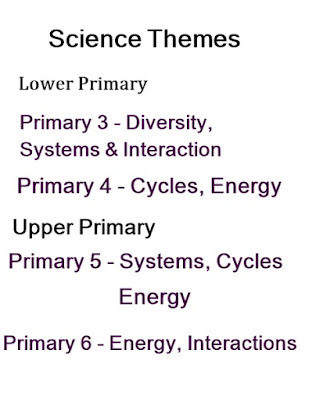 In the Biome introductory package the boys were introduced to the various eco systems in the world. 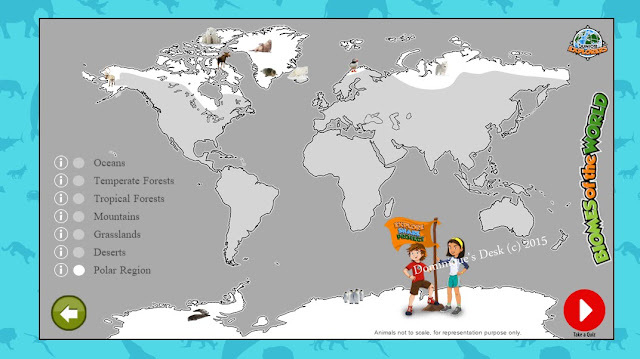 First off in the Biome mission they were introduced to the world map and were able to look at the different fact sheets that were associated with the animals in the different regions. 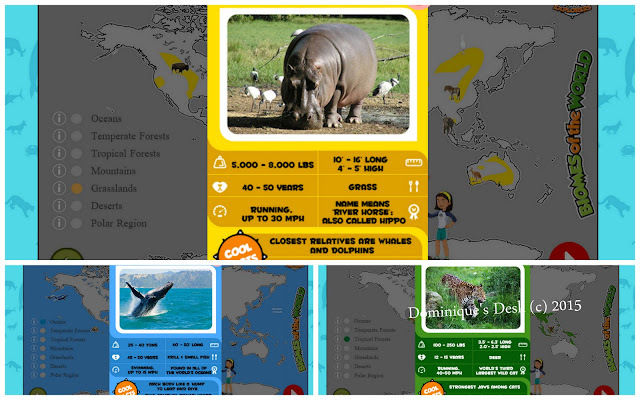 There was a variety of animals living in the ocean, forests, mountains grasslands, desserts and polar regions. 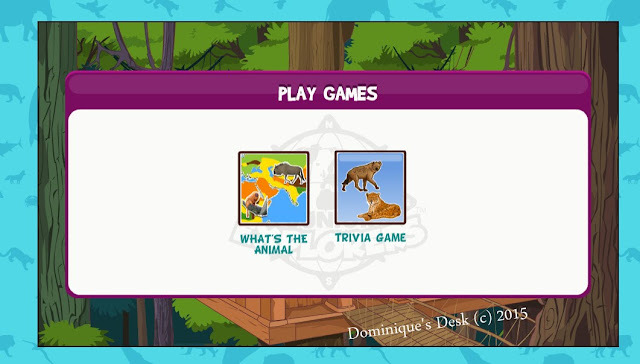 When you click on a picture of the animal a trading card fact sheet will pop out on the screen. 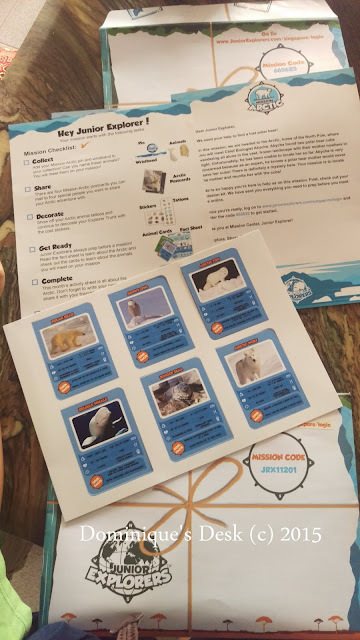 The boys got to view the six trading fact cards and much more when they were going through the factual part of the online segment of the unit. It got a bit overwhelming for them as they felt they were suffering from information overload after clicking on more then 20 different animals in the last 10 minutes. If you are not for screens popping up in front of you all the information in this section can be found in the Field Guide which was in the kit. The boys cleared these games quite easily as they were much simpler as compared to the ones in the Arctic mission. In all it took us slightly more then an hour to complete both missions. Having tried several different monthly home kit I was curious to see how this particular one fared in comparison to the others we have tested. I marvel at the informative part of the package which has chock full of facts on the different creatures in each package. Each section is repeatable and one can go back anytime to redo parts of the mission of try the various games again. They were amaze by the tons of information available at their fingertips in regards to the various ecosystems and their inhabitants. It was great to learn new facts which they will be able to share with each other or their friends on a later date. They would love to have more games to try out within each mission and am looking forward to more varied games in the upcoming mission packages. I personally felt that the mission could be tailored to suit kids of different ability levels so they would be able to benefit more from the package. 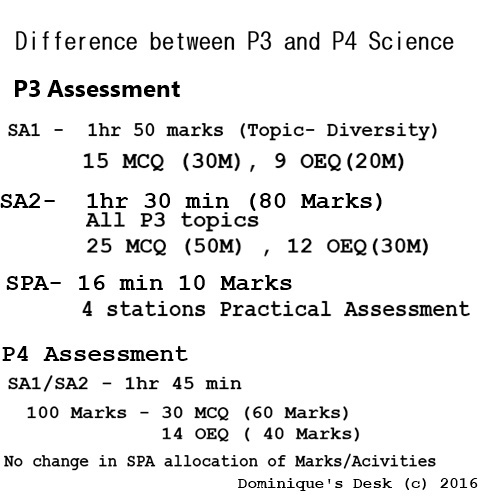 It would be great to have possibility of setting the topics based on different difficulty levels so that more advance and older kids will be able to learn Science at their optimal speed. 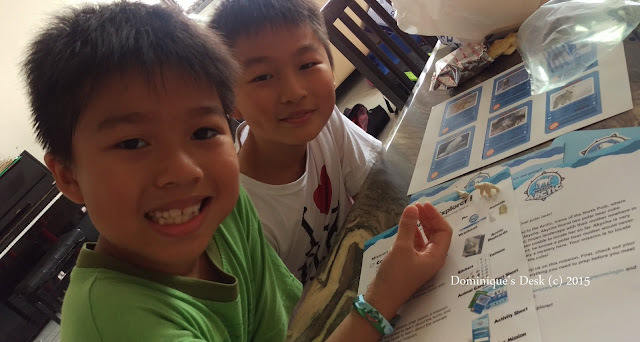 If you have young kids and are keen for them to learn more about science do check out the Junior Explorer website to know more about what they offer. 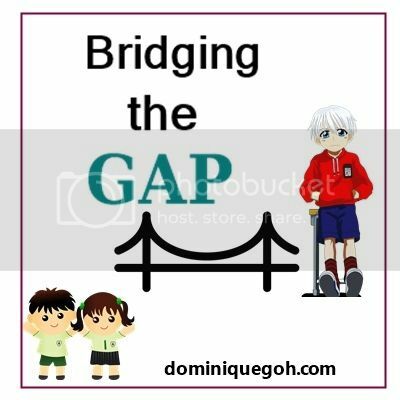 Disclaimer: This is and Advertorial in collaboration with Junior Explorers. All opinions are 100% my own.